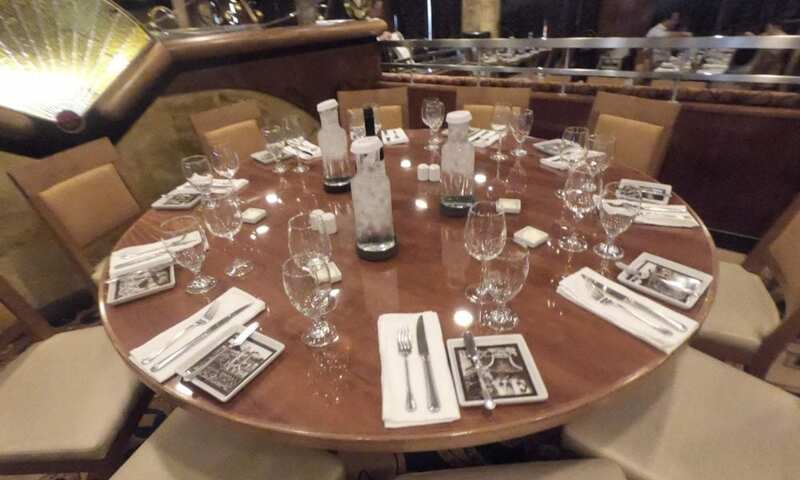 For a number of reasons, after what felt like hundreds of cruises (it was actually less than 10), I had yet to try Traditional Dining on Carnival Cruise Line. For the most part, I like any-time dining because it allows me to eat at a table for two every night at approximately the time that I want. But still, I wanted to try out Traditional/Assigned Dining so that I could have a real opinion about it and a basis for comparison. My recent cruise on the Carnival Inspiration was just a three-day itinerary, which felt like a great, low-stakes way to try it out. I selected early dining, which is at 6 p.m. – a little earlier than I’d like to eat, but the 8:15 p.m. late dining makes you miss all the fun nighttime activities. We arrived exactly on time since I’d heard they’ll wait to serve the table if people are late. We were directed to our table, the number for which was printed on our Sail & Sign card along with our dining room and time – how great is that?! I realized that there wasn’t a host stand for this dining room because, aside from the first time you go, you don’t need anyone to show you to your table! That means no lines to get into the dining room, people will just walk right in and go to their tables. If you’re familiar enough with the dining rooms, you could skip asking for directions even on the first day. We were seated at a table for 10 people. That’s actually pretty big now that I think about it, but it seemed reasonable that we would be seated with a couple of families or maybe even four couples. I crossed my fingers that everyone we would be sitting with for the next three days would be nice and, maybe as a bonus, close to our age. We were given menus and poured our water. We carried on some wine so we had glasses of it with us. So far, no one joined us. After 15 minutes our server came back and offered to take our order unless we wanted to wait for everyone else. We didn’t know if anyone else was actually coming so we placed our order and laughed at our failure to dine with strangers. A few minutes later another couple finally joined us! They seemed pleasant and we chatted with them a little bit. They said they were cruising with a large group so they were surprised to see strangers at their table and also were very sure that the rest of the seats would be filled in with their group. What I already knew about assigned dining is that each cabin’s booking numbers must be linked in order to be seated together, and if they were assigned to our table, then their booking number wasn’t linked to the rest of the group. I kind of tried to explain that and said I didn’t think their friends would be joining us but he was sure and kept apologizing that his friends would be crazy. Spoilers: No one else joined us. The conversations stayed pretty much separate for the rest of dinner, which was totally fine. I enjoyed my dinner just fine but didn’t feel like I got the full experience. What I did notice was that the service was much faster than any-time dining. We had multiple appetizers, an entrée, and dessert and we were done in just over an hour. I personally don’t like a long, relaxed dinner as there are so many fun things to do in the evenings. Night two we skipped because we had booked Chef’s Table. The last night we again were first to our table. Since our table was empty, the couple that was at the next table over offered to join us as they prefer to eat with fellow cruisers, but the Maitre D’ has sat them at a private table due to them cruising for their anniversary. We were happy to have them join us, and the couple from the first night did not show up. The new couple told us that there were about six people there the night before, so who knows where they all went. The four of us had a lovely time dining together, and finished off with a Warm Chocolate Melting Cake. Our dinner was not quite as quick this time, but we were still done in only 90 minutes, which would be fast for any-time dining. I still would prefer any-time dining over the late seating for assigned dining, due to how much it cuts into the evening events. While I definitely see the appeal of any-time dining over traditional dining (you don’t have to worry about sitting with people you don’t like) I overall preferred my assigned dining. I was able to get to my table quickly, order quickly, and my food came out quickly. The only thing I don’t like about it is that if there’s something I want to do early in the evening, I won’t have a lot of other dinner options as I’ve forfeited my dining room spot for that night. On the Inspiration, the only alternatives are the buffet, pizza, or the very limited room service menu. I have traditional dining already selected for my next cruise, and I’m now definitely going to keep it… but I may try to request a table for two.